It’s still dark most of the time, but we enjoy the increased sunlight, more than eight hours of it now. Most noticeable is the sun’s height in the sky. At noon it’s as high above the horizon as the width of your hand, as seen from arm’s length. We’ll be seeing snow for another four months, but the light brings us the distant promise of another arctic summer. Oddly, the increased sun brings on a period that used to be called “suicide season” in western Alaska. (Since KNOM went on the air, spring suicides have greatly dropped. We hope that we have been part of the solution.) It’s a time when we pay extra attention to making our signal as bright and as interesting as possible. Thank you so very much for making our work possible. God bless you for it! SLEIGH BELLE: (left) Meet new KNOMer Robyn Woyte, who’s joined KNOM as office assistant. 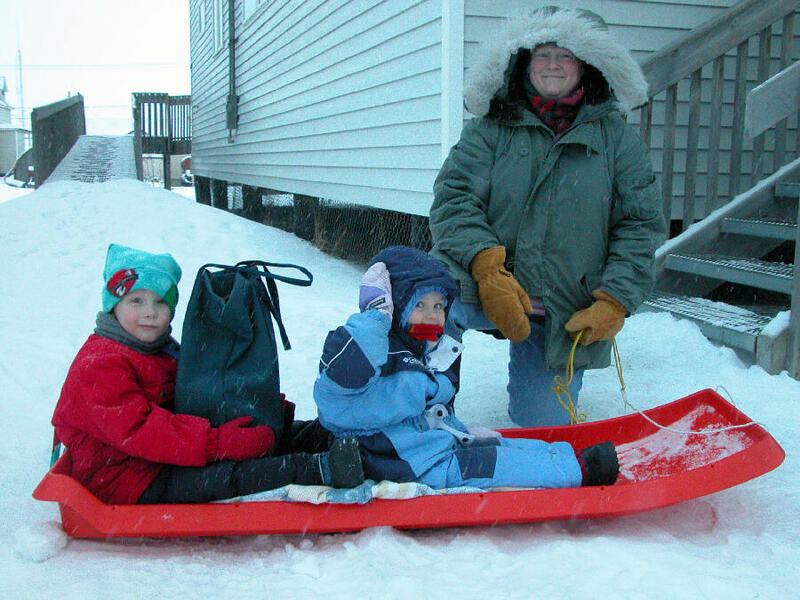 Every day, she totes children Steven, 5 (at left) and Gracie, 2, by sled to the post office to pick up KNOM’s mail. Robyn’s husband, Major John Woyte, who is in the Alaska Army National Guard, is currently serving a year’s term of duty in Iraq. among others. They’ll air about 2,800 times this month, thanks to you. ALAP'AA!!! It's spelled variously in Alaska Native dialects, but it's pronounced the same: ah-lah-PAH! and it's always spoken with gusto. The translation is "how cold it is!" and it was exchanged freely for the last two weeks of January, when a Siberian high pressure cell poured air across Nome directly from the North Pole. Day after day, the temperature dropped into the thirties below. It's not nearly as cold as it could be, but it's cold enough for us! KID STUFF: Sunday mornings, program director Kelly Brabec has added a new syndicated program, “Karen and Kids.” It’s a fun show that teaches valuable catechetical lessons. INSPIRATIONAL SPOT: Because Jesus died for us, because he lives in our hearts, because he stands before us. . .we are free. LISTENING: (left) KNOM public affairs director Amy Flaherty edits an interview in “the Bat Cave,” a small editing booth in the rear of the studio building. In January, Amy flew northwest 60 miles to the Inupiat Eskimo village of Teller, home for 241 souls. She was in the village primarily to record interviews with seniors for KNOM’s “Elder Voices” program, but managed to speak with lots of other folks, too. In this photo, Amy is wearing a traditional Eskimo kuspuk, a kind of parka made of light cloth. This one was hand-sewn in Barrow. MORE POWER TO YOU: This spring, we are putting extra study into installing village translators, and how that will relate to a proposed increase in our power to 50,000 Watts. Tom Busch will be flying into some of the most distant villages to take measurements on the strength of the signal they receive. Raising our power will add to the electric bill, but may allow us to feed some of the translators off the air, instead of by satellite. Satellite costs can run $10,000 per year per village, and we have 13 translators to construct. Increasing our power would cost about $40,000 annually. If we can feed three or four translators directly from our air signal, the expenses would balance out, while giving other distant listeners a dramatically better signal, too. Further, a power increase might eliminate the need for a couple of the translators. Please stay tuned! GETTING OUR “BERINGS”: Bering Air is the safest bush airline in Alaska. Ever since it was founded in 1979, it has provided KNOM free travel to villages. We cannot thank owners Jim and Chris Rowe enough. In the past five years alone, they have contributed $35,372.70 in tickets! 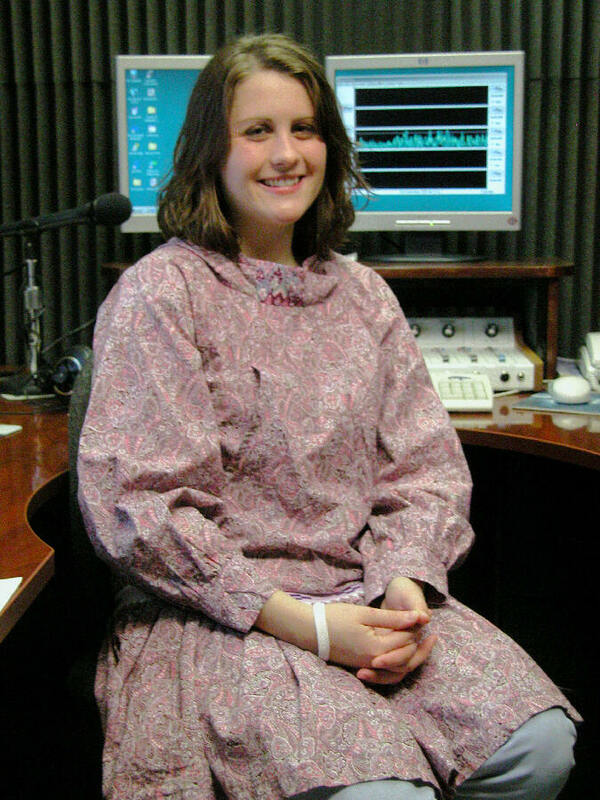 KNOM is the oldest Catholic radio station in the United States, thanks to you. INSPIRATIONAL SPOT: Matthew’s Gospel sees Jesus as God’s Light, not only to the Jewish people, but to the whole world. As each day in Alaska grows a bit lighter, the land will soon awake. We awake as persons to the Light of Christ by practicing the values of the kingdom which Jesus proclaimed: Justice, forgiveness and compassion. ON THE GO: (left) KNOM news reporter Jesse Zink is getting around. Recently, he was 100 miles east of Nome in the villages of Koyuk and Elim, covering presentations by officials investigating the subject of missing persons. It’s become a serious issue. Over the years, a dozen or more villagers have disappeared in Nome, and some suggest that might be due to a serial killer in town. Further, there is the perception that Nome’s police department is racist. Jesse also reported on the U.S. Attorney for Alaska, Tim Burgess, speaking with high school students about the dangers of methamphetamine. Jesse interviewed Burgess in Koyuk and was able to record his meth presentation to students in Elim. KNOM broadcast portions of that presentation so that the entire region could learn about the dangers posed by meth. I DUNNO. JUNEAU? With the Alaska legislature back in session a distant 1,100 miles away, Jesse Zink has revived KNOM’s “Juneau Journal.” It’s a weekly program that discusses bills that could affect rural Alaskan life. There is a dire need for more licensed foster parents in the region. The alternative is to send children five hundred miles away to the city. We talked about entrepreneurship in rural Alaska. One example is a new pizza restaurant that has opened at the Nome airport, shipping gourmet pizzas to villages by small plane. In the studios was Fr. Michael Oleksa, a Russian Orthodox priest who is Alaska’s premier expert in cross-cultural communications. He had been in the village of Gambell training residents on community wellness, as well as providing suggestions on how to raise children. A theater in Juneau brought staff to villages to collect traditional raven stories and masks, preparing for a show that will feature elements from every Alaska Native culture. In many traditions, raven is a trickster-creator who leads people on their paths of self-discovery, using humor to present his lesson. Please consider adding missions like KNOM to your will. We prayerfully place all bequests into funds that provide major capital improvements, and protect the mission from unseen emergencies. INSPIRATIONAL SPOT: Of all the things we do, God is most pleased when we repent. INSPIRATIONAL SPOT: Is there someone in your life who prays for you? Is there someone who makes tough times easier to bear, by your knowing that they’re on their knees, pleading to the Lord on your behalf? We are all blessed by people who pray. They are like sheltering trees, shielding us from the harshest conditions. They stand tall and help us to keep faith. It’s always a great comfort to know they are there. 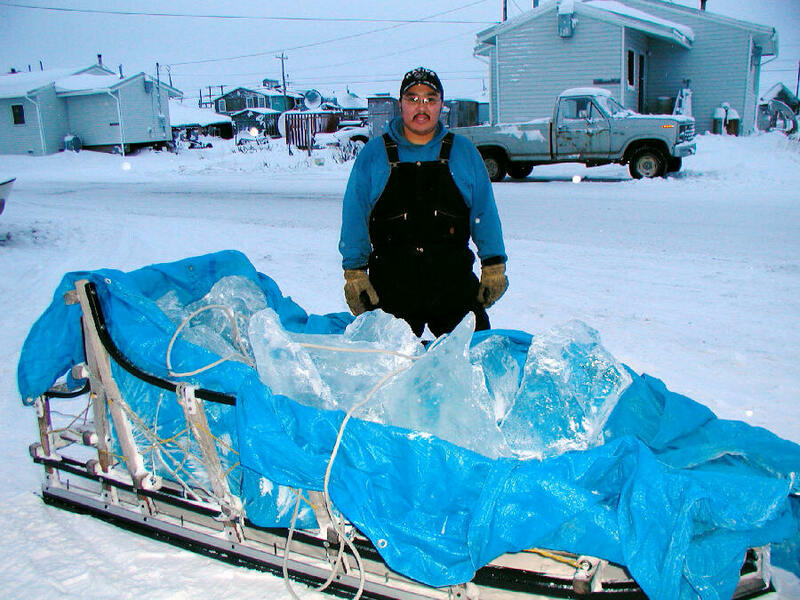 “HARD” WATER: (left) In Teller, Amy Flaherty caught these photos of Norman Menadelook, Jr. delivering a sled load of ice by snowmobile. 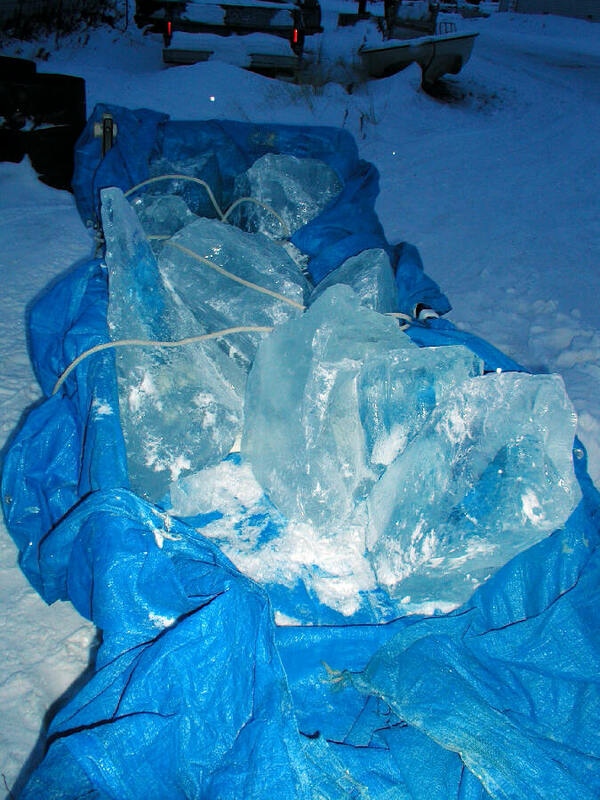 Norman chipped it out of a pond six miles away, across frozen Grantley Harbor near the village of Brevig Mission. To bathe, they heat the meltwater on a stove and pour it into their tub. Draining the tub involves bailing it out with a saucepot. Most drinking water for the village of Teller comes from snow from a different location, two miles from town. Teller has no sewer or water service. The cost per load? $70 per load. That's up from $50 due to the skyrocketed price of gasoline. A GAS: In western Alaska villages, gasoline averages about $4.60 a gallon. Fuel oil is $4.05. With a high percentage of the population in poverty and dependent upon gasoline to power snowmobiles and boats for fishing and hunting - and drinking and wash water - it’s a terrible burden. 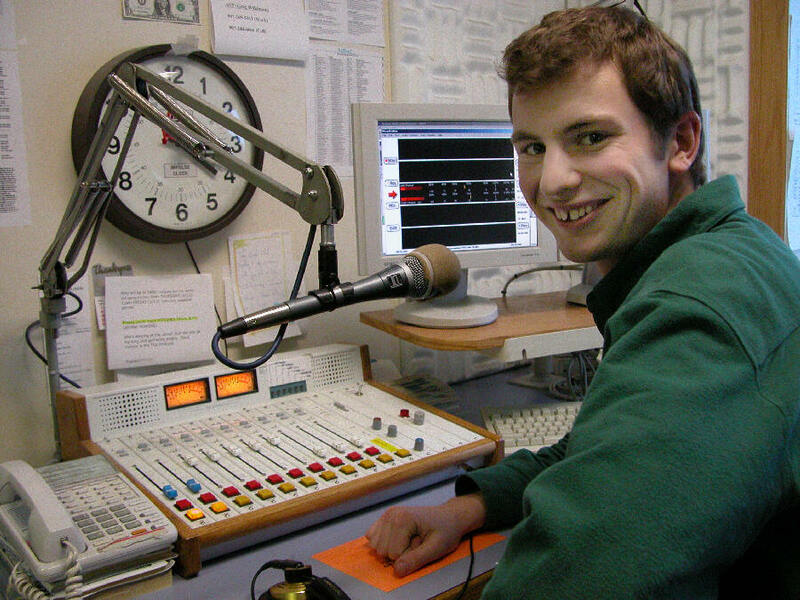 BY THE NUMBERS: Due to rising fuel costs, KNOM’s monthly utilities, covering the transmitter, studio and volunteer dormitory, now total a staggering $9,500. We thank God that in 1992 and 1993 our benefactors provided us the means to build highly efficient super-insulated buildings. THIRTY YEARS AGO: In February 1976, encouraged by Nome’s Northwest Community College, KNOM produced “Word of the Day,” a Western Alaska aural Rosetta Stone. It featured a word in English, its Inupiat (in-OO-pee-at) counterpart voiced by King Islander Bernadette Alvanna and in Yup’ik (YOO-pik) by KNOM volunteer Florence Francis. AGAIN, we sincerely thank you for your faith in our work, and for the kindness you show to the most remote people whom we serve. We hold you in our prayers, and we are constantly mindful of your importance to our mission. May Our Lord bless you abundantly.